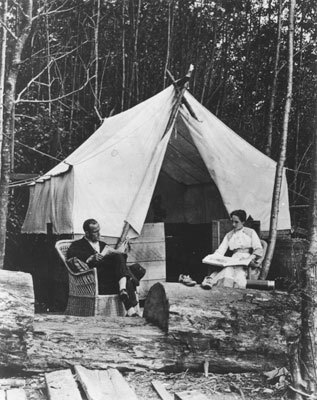 Portrait of Jenny and George Barker reading outside of their tent home. The tent was located at present day 22nd Street and Argyle Avenue on the waterfront. There is an accompanying news article stored with this photo. Scanned December 2011 using Epson Perfection V700 Photo at 300dpi and 100% of original image size. Alternate Versions: Lossless TIF from original scan at 300dpi and 100% of original print. W19 x H24 cm black & white print on photo paper.